In today’s blog posting I want to dig into a completely different area in SQL Server: how to debug SQL Server with WinDbg – the debugger that comes with the Debugging Tools for Windows. Before we go into the nasty details, I want to explain in a bit in more detail why I have chosen such an obscure topic to blog about. Why on earth do you ever need a debugger like WinDbg when working with SQL Server? The short answer: NEVER! SQL Server is a stable product and you should be always fine with the troubleshooting techniques (Extended Events, DMVs/DMFs) provided by it, without ever having a need for WinDbg. And if you are in doubt, you should always contact PSS first, before trying to debug a nasty SQL Server problem yourself. 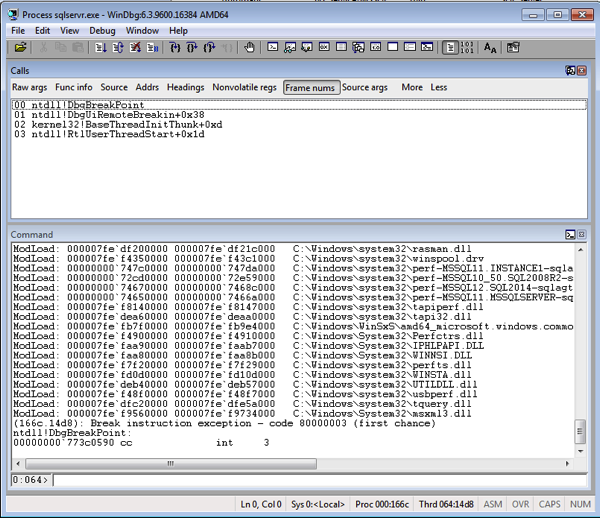 What are the reasons for using a debugger like WinDbg? For me it’s mainly about education, and learning *how* things are working internally in SQL Server, and *how* relational database engines are implemented. When I’m dealing with customer problems, I sometimes see crazy things happening within SQL Server, which I have to explain. Therefore the more I know about SQL Server, and how SQL Server works, the better it is for me and my customers. Before we go into the details how to setup WinDbg for SQL Server debugging, I first want to give you a high level overview about the most important SQL Server DLL files, that you will use during debugging. Let’s have a look on the following figure. 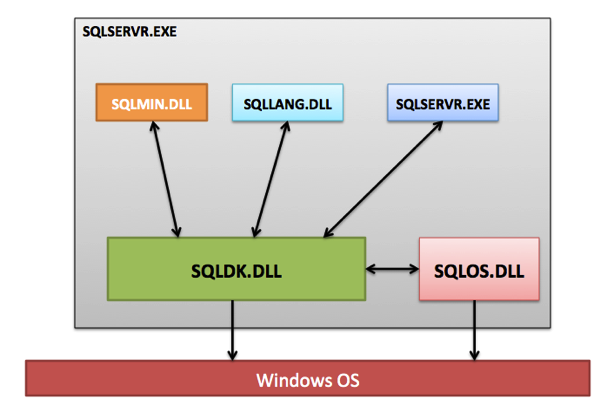 The DLL file sqldk.dll (SQL Server Development Kit) implements by far the largest part of SQL OS – the OS that is part of SQL Server which handles thread scheduling and memory management. sqlmin.dll implements everything regarding the relational engine itself, including the Storage Engine, Data Access Methods, Lock Manager, Log Manager, LazyWriter, and other components. This file is one of the most important ones for debugging, because it contains the major well-known components of SQL Server. In addition you will also have the DLL file sqllang.dll that contains everything regarding the T-SQL language, and the Query Processor itself. The program execution has currently stopped, because you hit a breakpoint in the module ntdll. ntdll is a simple wrapper DLL provided by the OS, which performs the transition from user mode into the kernel mode. This means also that now *every* thread within SQL Server is stopped, and no more work is done anymore!!! NEVER EVER try to attach WinDbg to sqlservr.exe in a production environment! If you want to resume the execution of sqlservr.exe just hit the F5 key on your keyboard – SQL Server is running again. If you want to break the program execution again, you have to set a specific breakpoint somewhere in the process space of sqlservr.exe, or you can also break the current execution by the keyboard shortcut CTRL + BREAK. In which class is the Lock Manager implemented? What functions are used to acquire and release latches? What’s the name of the class that implements the SQLOS Scheduler? Please feel free to post your answers as a comment. In this blog posting I have given you a brief introduction to WinDbg, and how you can use this debugger to attach it to SQL Server. As you have seen, the process space of sqlservr.exe consists of multiple DLL files, where every DLL implements a larger set of components of SQL Server. When you have configured the path to the public symbols in the correct way, you are able to retrieve a lot of meta data information about the various classes and functions that are part of SQL Server. The WinDbg command x is here your friend. I hope that you have enjoyed this very specific blog posting, and next week I will show you, how you can debug and execute a SQL Server query instruction by instruction within WinDbg. I will try one time, let’s see if I’m doing something wrong. A: I’ve found this: sqlmin!LockManager::* then I can get all Lock Manager functions. Regarding latches: sqlmin!BUF::AcquireLatch & ReleaseLatch is only for BUF latches. How can we check Non Buffer Pool part in WinDbg? You can use the DMV sys.dm_os_memory_clerks to see the memory distribution from a SQL Server perspective. Can you recommend me some resources for learning how RDBS are implemented internally ? I’m trying to develop my own small DB, just for fun and broader understanding of how things are implemented ! apart of the reasons you mention to learn this topic, it’s also necessary when you have to analyze a minidump. Maybe if you continue this series, a post relating how to do that should be great. “Transaction Processing: Concepts and Techniques” by Jim Gray & Andreas Reuter, Is there pdf of this book? And if I can download this excellent book would be lucky. No, you have to buy a hard copy of that book. The stand alone of WinDbg install cab, the newest one, would you you provide me a direct download link.? For me in china mainland,it’s kind of difficult for to do that from Microsoft website. “No matching code symbols found, no breakpoints set. What wrong am I doing ? Please help me out. I wish to use WinDbg to dig into memory dumps. Production servers are almost always isolated from the internet so it is not possible to launch WinDbg on them and dowload symbols. Is it possible to download symbols on an other machine and the copy downloaded symbols on the production server? I would copy the memory dump to another machine and debug it there.